LAUSANNE, Switzerland -- The Asia Series Executive Board reached a unanimous decision to cancel the Asia Series 2014 at a recent Steering Committee meeting surrounding the 17th Asian Games in Incheon, Korea. President Riccardo Fraccari of baseball's world governing body (World Baseball Softball Confederation [WBSC]) was also in attendance at the Asia Series board meeting. 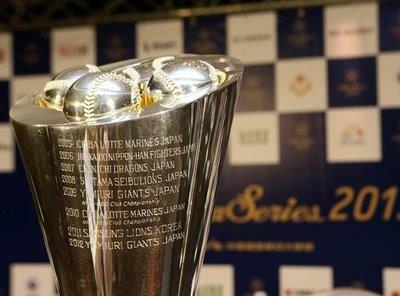 First held in 2005, the Asia Series is an international “tournament of champions”, played under the auspices of the WBSC, that involves the annual professional baseball champions of the Australian Baseball League (ABL), Chinese Professional Baseball League (CPBL), European Club Championship, Korea Baseball Organization (KBO) and Nippon Professional Baseball (NPB). ABL’s Canberra Cavalry won the 2013 title and the 13.0 million Taiwanese dollar cash prize (approx. US$ 427,000) that went along with it. Factors that weighed into the board’s decision to cancel plans for the 2014 Asia Series included the resignation of CPBL Commissioner Jenn-Tai Hwang and the re-structuring of the CPBL Executive Board. It was also noted that the NPB-Major League Baseball series featuring the national baseball team of Japan, "Samurai Japan", in November, along with the break of the KBO regular season, to allow KBO players to participate in the Asian Games, made it particularly challenging to identify a suitable date for this year's Asia Series, while maintaining the best interests of the players and ensuring no competition schedule overload. The ABL, CPBL, KBO and NPB -- all Associate Members of the WBSC -- announced that they remain committed to providing their “full support” to WBSC and President Fraccari to return “our beloved sport to the Olympic Games”. Asia Series executives reconfirmed their respective professional baseball league's commitment and dedication to promoting the global growth of baseball, together with WBSC, especially among young people and emerging nations. Further plans of Asia Series 2015 will be tabled at the next steering meeting, which is scheduled for early 2015.